The last in my collection of York Pullman vehicles, that’s worth showing that is, shot into sun again, apart from having my finger in front of the lens I couldn’t have got it more wrong. Anyway this shot does show off York Pullmans distinctive livery, there was a darker yellow band below the windows unfortunately the upper band does not show very well in this shot. York Pullman took delivery of three of these Regent IIIs in 1954 JDN 667-9 fleet numbers 63-5 fortunately number 64 was restored by Tony Peart to a very high standard and on his death passed to the Lincolnshire Vintage Vehicle Society. Chassis, body, operator – almost perfection. [Well you know I prefer heavy weight AECs – or heavy anything, come to that!] …..and if my bad photos turned out like this one I’d be very happy. A very handsome vehicle in a very handsome livery, and the shadow cast by the sun shows the waist rail up a treat. For anyone interested, there is a video clip on ‘you tube’ aboard 64 (JDN 668), touring around Lincoln. Whilst watching and listening to this, I could not help thinking that the gearbox sounds were very similar to those of pre-war AECs. Was the gearbox of prewar design by any chance, or a modified version perhaps? I suspect the aural beauty of all manual AEC boxes lay in their pre-war origins. I would also like to associate myself with the affection expressed for the music of the AEC manual gearbox. My early recollections are of Midland General specimens (including some pre-war front entrance Regents), various Trent examples, and later Grimsby’s ex-London Transport STLs. Just a few weeks ago I had the enjoyment of the same sounds on a preserved Regal/Strachans during the Kingsbridge 7ft 6in running day – all the way from Kingsbridge to Totnes and back – a hilly run with plenty of second and even first gear work. Yet another vote here for the glorious sounds of the AEC manual gearboxes. 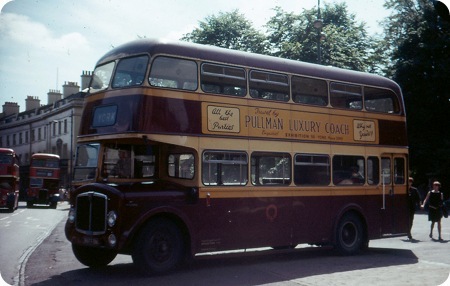 The much travelled and totally rebuilt example that we had at Samuel Ledgard’s (FJW 938) was a fine example of the original sounds with further fascination from a good deal of wear – originally a Birmingham Corporation Regent 1 it arrived with us as a "Regal" coach with Burlingham bodywork (the rebuilding by Don Everall of Wolverhampton). It was a joy to work on but its raucous subtleties (if that’s not a contradiction in terms) didn’t filter through to the passengers – their loss of course !! When the new Regent Vs arrived further aural delights were to be enjoyed. These fine vehicles had a rather higher pitched and "purer" sound which disguised the already civilised and quiet 9.6 litre engines somewhat and gave a distinct "petrol" impression – those senior ones among us have experienced some glorious times which are not to be had on service work today. Oh Chris. Don’t get me started again about STD Regents on the hills of Sheffield and Derbyshire! The place to stand, if I recall hazy memories, was the middle of Shude Hill in Sheffield as the many buses climbed towards High Street. The AEC’s, especially the "big bore" Regent V’s would blast hot exhaust across the central island, but the III’s would sometimes seem to have what we boy racers would call valve bounce. As for the tin-front Titans- was it more a sort of strangled wheeze? That may be inaccurate, but I do remember one Regent going up at full chat and a man saying to a woman next to me "that’ll singe tha nylons luv"! A could of been better shot of a York Pullman Regent V with its rear doors closed. Talking of which does anybody know how the rear doors worked, were they air operated by the driver or operated by the conductor either manually or air assisted. I once went by normal service bus to Scarborough from Halifax via Bradford, Leeds and York, so the chances of going on a West Yorkshire K series with rear doors on route would be odds on I would of thought. But I can not remember the operating system of the doors, if you know please leave a comment. I was obviously new to the skills of photograph back in 1966, the number of shots I have that were taken into the sun is amazing. The trouble is, with half cab buses the more interesting side is the near side which is not the easiest side to take angle wise. So when a chance for a near side shot came up you took it and hoped for the best, I could always retouch out the shadow that’s not a difficult job but then the shot would loose its originality. A full list of Regent V codes can be seen here. 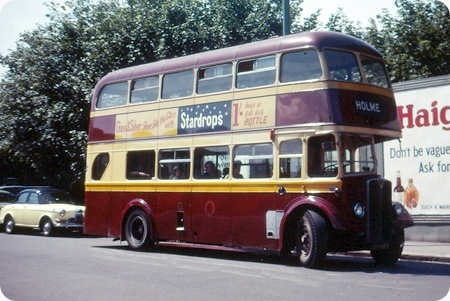 Don’t know how the doors on the York Pullman AEC in your photo worked, but the West Yorkshire K series buses all had conductor operated doors. As often as not, the doors were left open except when the conductor had finished collecting fares and knew that it was unlikely that the bus would stop soon. Obviously, opening and closing the door was virtually impossible when the bus was frequently stopping and starting, when the conductor would be busy collecting fares, particularly on the top deck. Going from York to Scarborough, for example, (Route 43), the door would probably be left open until the bus had reached the outskirts of the city. The answer to your question is the rear door on the York Pullman Regent V was operated by the conductor. My late dad was a driver with York Pullman and I can say he has driven this and all the buses in the old fleet he was paired with Danny Weaver his conductor and yes I am a bus and coach driver, if you would like any more info on the old York Pullman then if I can I will only be to pleased to do so. 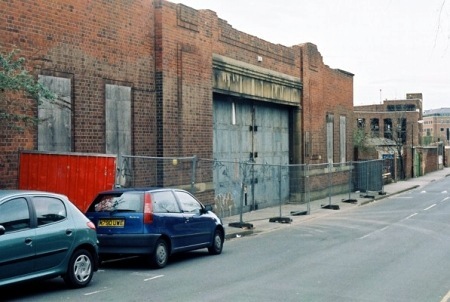 I remember very well the old depot on Navigation Road, York then Peter Dew and his ‘Top Line Travel’ buses worked out of there when it was a car park how do I know? I drove for him and it is a pleasure and honour to drive from the same place as my late dad. I have spent many happy hours at the York Pullman depot dreaming of driving a bus sad but true. Hi, I am clutching at straws here at the moment but I am trying to find out information on my father, Mr Donald Fewster who worked on York Pullman buses in the 1960s. Any information would be very gratefully received. Gosh, this is stretching the purpose of this site rather, but I was intrigued by Brian Lloyd’s enquiry about his father, Donald Fewster. That isn’t a very common name and there can’t have been many Fewsters in York, so maybe I, (or rather my dad), knew a relative of Brian’s. He was Alf Fewster, who had a greengrocer’s round with a horse and cart, and, later a Jowett Javelin, (Reg No. FDN 750). Any use, Brian? I clicked on this website cause I’m trying to find anyone who knew my dad, Geoffery Phillips, who worked for York Pullman until he left in 1990 ish. I know he knew Pete Dew and he used to say that the company was called Raynard Pullman. is this true? any help gratefully received. York Pullman was bought out by a Father and Son called Marsh, who had earlier bought the Reynard Car Hire and Garage business, they had previously bought Broadbent of Stamford Bridge and Walkers of Tadcaster and combined them as Reynard Coaches. After the takeover, York Pullman traded as Reynard Pullman. In 1990 the York Pullman Coach business was sold to Hull City Transport. The bus part of the business was renamed Reynard Bus and was sold to the Rider Group (later to be part of First Group) later in the Year. York Pullman later passed to Durham Travel Services and then, in 2000 to First Group. The Current York Pullman was formed in 2007 by K and J Logistics. On a visit to York last year, I had a walk along to Navigation Road to see if the depot remained. I had never been before and there didn’t seem to be any sign of it. Is it now demolished or re-developed? Yes-demolished a few years ago and replaced with student accommodation. Last time I saw this bus it was in a state with the engine out and wires everywhere, the body had been lifted of the chassis. I looked with a view of restoring it but bought Chesterfield Daimler 266 instead. Don’t worry Andy Tyler – you’re far from being alone and its not sad at all. I spent much of my childhood and teenage years around the Samuel Ledgard depots at Ilkley, Otley, Yeadon and Armley "dreaming about driving a bus" (and West Yorkshire at Ilkley too) and succeeded in doing just that – for forty four years. I worked for many fascinating firms – Samuel Ledgard, West Yorkshire, Murgatroyds, Wallace Arnold, Independent Coachways, Leeds City Transport, South Yorkshire Road Transport, Caldaire (West Riding), British Bus, Cowie, Arriva – a dream come true and no regrets at all !! Another dreamer! I finally learned to drive a bus at 50 years old (passed the test first time) Had 8 years with Southern National (Cawlett era). The stress finally got to me and I retired early. now living in York. Will extract a pic of Navigation road garage being demolished from the hard drive and send a copy in. Whilst researching this bus I noticed that York Pullman got there first double deck buses the year prior to this bus in 1954 they were 3 Regent IIIs. I have photos of two of them which I will upload one day. I also noticed that they only had 10 double deckers in there whole history until being swallowed up by Yorkshire Rider in 1990 the York Pullman name was sold to Kingston upon Hull City Transport I think for coach operations. 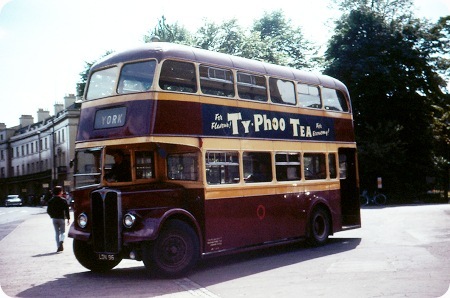 My Auntie Ada (Wilson) used to be a clippie on York Pullman – I remember when they had the half hour stop over in Easingwold, she and the driver would turn up at our house for a cuppa and a bun. Can’t remember any of the drivers, this would be in the late 50s, early 60s maybe. Ada was married to my Uncle Ted. They lived off Lawrence Street between James St and Granville Terrace. I think this must be the very last photo of Pullman’s garage in Navigation Road. It was an empty cavern the day before and flattened the day after. I had the quick thinking to take the camera along or I would have missed it. They’re back out on service work again and concentrating of coaching which has noticeably increased. The staff of the ‘New’ York Pullman Co did rescue the name letters from over the door. Now at the depot in Rufforth. Where the office (reopened) in Bootham tower. Now used for the same job by Transdev. Oh how sad! I’m glad to have seen it but I almost wish I hadn’t if you know what I mean. I’ve so many lovely memories of this depot and the York Pullman company. Progress, I think It’s called! When was the photo taken, Steve? If it is any comfort, I looked on Google Earth and found that when the current image was taken, the walls from the temporary fence onwards were still in existence. The main building nearest the camera however has gone totally and is now a block of flats but then, they are quite attractive so at least the land went to good use. I fear that by now, all of the rest has gone the same way unless "saved" by the recession. Am I correct in talking about the Regent that belonged to the late Tony Peart that it has a replacement top deck as I heard that it was badly damaged in a low bridge accident and had to return to Crossgates for rebuilding. Philip There is a picture in the Geoff Lumb book about Roe showing the Regent prior to repair awaiting its turn at Crossgates. Just to say that York Pullman 64 is indeed at the Lincolnshire Road Transport Museum and it is expected to be on show and give rides this Easter Sunday . A lovely bus ! I was a driver for York Pullman from 1972 till 1985. I remember very well driving the AEC double decker, fleet no 64, 65, 71, 72 plus two half cabs. I also remember Gerry Rank and George Tyler plus Ada Connell and her husband Noel, there was so many employees at that time and back in 1972 getting drivers to stay was most difficult because of the low wages. I found it was sad when the old directors decided to sell out and recall at the time it only took the new owners a couple of years to wreck a very good and long established bus company.